Home > Mountain Biking > What Is Mountain Biking? Mountain biking differs to track or road cycling as it mostly takes place off-road. Despite the 'mountain' part of the term, most mountain biking doesn't actually take place in the mountains. Because of the differences between the types of cycling, mountain biking requires a specialist type of bike, known as a mountain bike. What Type of Terrain can you Expect to Tackle? Generally, mountain biking takes place on rough terrain, which will usually be muddy and often contains rocks. This is why mountain bikers need a specialist all-terrain mountain bike, as they are far better suited to the challenging conditions. Steep Trails – This can be either uphill or downhill, but many mountain bike trails are one or the other. Steep Climbing – To climb successfully, you need to achieve the right balance point. On a fairly steep climb, you can often do this by pushing your body weight forward (but without moving forward in the seat). For very steep climbs, you will often need to move forwards in the seat too. Down Hills – This often involves going over rocks. Relaxing your upper body is essential for executing downhill climbs. This stops you from slowing down too much, which helps you to get a little bit of added momentum. When going over rocks and other small obstacles on trails, this can save time and effort. Although it's tempting to keep hold of the brakes on a steep trail and this is often advisable for beginners, more advanced riders can slightly increase their speed when approaching rocks before slowing down again. Drop Offs – This is when there is a drop down in the trail path. The key to successfully executing a drop off at speed is making sure that the front wheel does not touch the ground before the rear wheel does. This can be tricky to do, especially for beginners. If you are new to mountain biking, you can take a course to equip you with the skills needed for riding a mountain bike (without coming a cropper!). 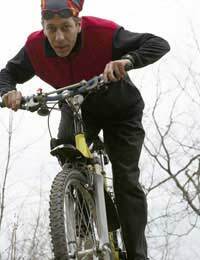 The Mountain Bike Instruction website offers training courses in Lancashire (at the same course that held the mountain biking race for the 2002 Commonwealth Games), including courses for beginners, and maintenance courses. These type of courses can be pricey, but they are a good investment if you plan to take up mountain biking on a serious basis. If you are interested in doing some mountain biking while you are on holiday, there are specialist cycling holidays that cater for enthusiasts. They will often provide a mountain bike for you to use, but keen riders may prefer to take their own bike and equipment along instead. There are a variety of holiday companies in the UK that offer cycling holidays, or even cycling tours. If you prefer to go a bit further afield, there are also companies that offer cycling holidays abroad (for example, the Spanish area of Andalucia is a popular destination for cycling holidays). You can find more information on mountain biking holidays in our 'Mountain Biking Holidays' article.